I attended Tom Hayden’s talk on Thursday with the rest of the mostly over 50’s crowd to hear his take on the depressing results of the election. He was somewhat comforting with his wit and that not all the outcomes were bad. California elected Jerry Brown and possibly Kamala Harris for attorney general. He reminded us of the important work Jerry Brown did as past governor in promoting alternative energy. As with any politician Jerry Brown is not perfect but he will move us forward in the area of green jobs and alternative energy. After a brief discussion on the election he went in to the quite depressing and disturbing reality of the United States involvement in current wars and the long war projected by some to be 50 to 80 years. Besides Iraq and Afghanistan he says we are at war with 19 other countries. He went into the cost of human lives and tax dollars spent. He says not only are these wars unaffordable they are un-winnable. He believes our military incursions are causing more terrorism. He did not leave us without hope. He expressed the strong connection between wars and energy resources. The more we move toward alternative energy the less dependence on foreign oil. A recent poll showed 75% of Democrats and 55% of independents want out of Afghanistan. Last year 112 members of the House voted to defund the war or place more restrictions on it. Even though more Republicans were elected we can play up the deficit spending issue with them. Also it wasn’t the progressive Democrats that lost their seats it was the blue-dog Democrats that lost. He said the election was devoid of talk about the war and its cost and both the Democrats and Republicans were complicit. I came away from the lecture with that he is in it for the long haul and he hopes we will be too. We still need to be out in the streets, lobbying our representatives, and educating everyone we can. Hayden said when you wake up each day you can think of a small thing to do that will further your goal for peace. I have always been a big fan of his so I may be biased but I found him to be still as passionate and knowledgeable about peace, justice, and environmental concerns as ever. During Q&A he was sometimes asked difficult questions by some in the crowd who may have been more radical or just frustrated with our state of affairs. He always answered their questions with patience and respect, which I find can sometimes be lacking in the progressive community. I would strongly recommend his web site tomhayden.com and buying his books. Colleen, welcome – is this your first article? I love the Green STore on Voltaire – just wish it was open more regular and longer hours. Thank you for going to listen to Hayden’s talk and letting the rest of us know where he’s at these days. 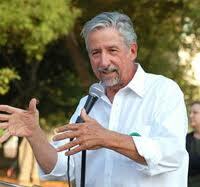 There is a direct correlation between Tom Hayden and the OB Rag. Can you guess what it is? Nice article Colleen. I have always been a big Hayden fan. It sounds like he is speaking the truth that most of this country doesn’t want to hear. Newer Article: Donkey Tears in San Diego – Can Progressives Build a Majority Here?